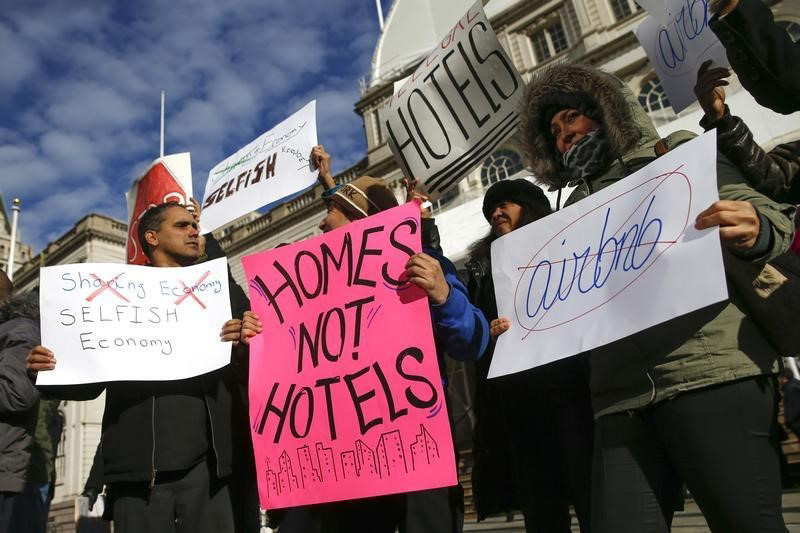 Opponents of Airbnb rally before a hearing called “Short Term Rentals: Stimulating the Economy or Destabilizing Neighborhoods?” at City Hall in New York January 20, 2015. REUTERS/Shannon Stapleton. SANTA MONICA, Calif. (Reuters) – – Santa Monica, a prime Southern California tourist destination, has approved restrictions on short-term home rentals that will limit companies such as Airbnb, in what the city’s mayor touted as model regulation for other communities to adopt. The Santa Monica City Council voted 7-0 on Tuesday to prohibit housing unit rentals of less than a month, unless the primary resident is also staying there and will pony up the same 14 percent occupancy tax hotels in the city must pay. The vote came after dozens of people engaged in short-term rentals protested at Santa Monica City Hall against the measure, which is scheduled to take effect on June 15. The move by leaders of the coastal city, which borders Los Angeles and has a population of more than 90,000, represents the latest tussle between a local government and Web-based home rental services such as Airbnb, which have become international emblems of the sharing economy. Santa Monica officials estimated about 1,700 housing units in the city were regularly rented out as vacation rentals. People who list their homes online for short-term rental say it provides them needed revenue, especially in areas where housing prices are high. Residents and community groups say short-term rentals arranged through the Internet subject neighborhoods to sometimes unruly interlopers and reduce housing stock, pushing up rental prices for permanent residents. He said he believed the city was on solid legal ground in case lawsuits. “We will continue to highlight the importance of fair rules with leaders in Santa Monica and throughout Southern California,” she said. Other state and local governments have taken steps to rein in the services. In New York, officials have struggled to enforce rules that limit short-term rentals in the metropolis. Santa Monica also had rules prohibiting short-term rentals, but McKeown said they went largely unenforced because of a lack of resources. With the occupancy tax the city will charge hosts, it will hire three employees to make sure rules are followed, he said.